Elias Davidsson’s book “The Betrayal of India : Revisiting the 26/11 Evidence” has raised a storm in India . Davidsson has developed his argument with detailed research and authenticated resources. Indian version of Mumbai attacks lies bare and exposed like a peeled banana. Davidsson has concluded that Indian state’s investigation of the attacks was a big eye wash to bamboozle the state narrative and cheat Indian and international audience, just to blame Pakistan. 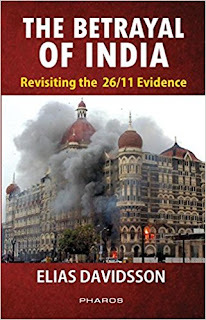 The author blames Indian establishment and their US partners and writes, “It is highly plausible, that major institutional actors in India , the United States and possibly Israel, were complicit in conceiving, planning, directing and executing the attacks of 26/11; evidence of a deceptive investigation is even stronger”. 26/11 or Mumbai attacks in November 2008 were projected as India’s 9/11,with an objective to tell US and international community that India was a victim of Pakistani State terrorism and the world needed to ostracize Pakistan. The Indian media went into frenzy, bewildering and confounding Indian, and, to some extent, Pakistani audience, some of Pakistani channels and media houses deliberately supported Indian version and strengthened Indian case. Repeated doses of Mumbai attack mantra has created intellectual dementia in Pakistan, where no strong narrative was developed to rebut Indian claims, almost accepting it like a fait accompli and grim reality. Indian courts ignored prime evidence and failed to reach at viable conclusions, doing injustice to the whole case. Powerful institutions in Indiaand the US were the main beneficiaries of this mass-murder conducted by Indian prime Intelligence Agency, RAW and her surrogates. Immediate finger pointing of the perpetrator is typical modus operandi in false flag operations. When officials claim to know the identity of a perpetrator prior to any serious investigation, this suggests that a false narrative is being initiated and that strenuous efforts will soon be made to implant it in the mind of a population. Lee Harvey Oswald was identified by officials as the killer of President John F. Kennedy and as a lone wolf with no associates–on the afternoon of the assassination day, long before an investigation and even before he had been charged with the crime. In the Mumbai case the PM of India implied, while the attack was still in progress, that the perpetrators were from a terrorist group supported by Pakistan. Key witnesses were not called to testify. Witnesses who said they saw the terrorists commit violence, or spoke to them, or were in the same room with them, were ignored by the court. Contradictions and miracles were not sorted out; one victim was apparently resurrected from the dead when his testimony was essential to the blaming of Pakistan. A second victim died in two different places, while a third died in three places. The number of terrorists who committed the deeds changed repeatedly, as did the number of terrorists who survived. Crime scenes were violated, with bodies hauled off before they could be examined. Claims that the terrorists were armed with AK-47s were common, yet forensic study of the attack at the Cama Hospital failed to turn up a single AK-47 bullet. Of the “hundreds of witnesses processed by the court” in relation to the attacks at the Café Leopold, Taj Mahal Palace Hotel, Oberoi-Trident Hotel or Nariman House, “not a single one testified to having observed any of the eight accused kill anyone” . Indian authorities declined to order autopsies on the dead at the targeted Jewish center in Nariman House. The dead, five out of six of whom were Israeli citizens , were instead whisked back to Israel by a Jewish organization based in Israel, allegedly for religious reasons . The surviving alleged terrorist had no public trial. One lawyer who agreed to defend the accused was removed by the court and another was assassinated. Mysterious malfunctioning of the majority of CCTV cameras on the days in question ; but only a very small percentage of the claimed footage was ever released and it suffers from serious defects–two conflicting time-stamps and signs of editing . Why no one from the Indian commando battalion of 800 soldiers rushed to battle ‘eight terrorists’ was allowed to testify in court? The suspect, after being convicted and sentenced to death, was presumably executed, but the hanging was done secretly in jail and his body, like the bodies of the other dead “terrorists,” was buried in a secret place. The FBI showed great interest, it actually had a man on the scene during the attacks and sent an entire team directly after the event. It was given direct access to the arrested suspect and to his recorded confession (before he even had a lawyer), as well as to eyewitnesses. The NYPD also sent a team after the conclusion of the event, as did Scotland Yard and Israeli police. -What are the dangers of False Flag operations in highly nuclearized zone, should Pakistan take India to ICJ for blaming her for an indigenous false flag operation conducted by RAW and western intelligence or ask for a UNSC resolution, does the international community cover false flag operations? -What role should have been played by Pakistani media during Mumbai attacks, and what role should be played in future to safeguard against false flag operations by Indian establishment on Indian soil or anywhere in South Asia? Should they become party to Indian narrative, have we calculated the cost of Mumbai attacks incurred by Pakistan due to the tarnished reputation of people of Pakistan and the Pakistani state? I recommend, the case on ‘Mumbai attacks’ be taken to Supreme Court of Pakistan and all those media hoses who colluded with Indian surrogates to build a case against Pakistan be asked to justify their stance. If Davidsson’s book has proved that the Mumbai attack on 26/11 was a false flag with Indian, American, British and Israeli intelligence collaborating to malign Pakistan, *who was their front organization in Pakistan, that needs to be probed and taken to task. And finally why has the Pakistani media not discussed this book, which has badly exposed Indian sinister designs against Pakistan?